OBJECTIVES – Achalasia is an uncommon disease of esophageal motility, characterized physiologically by failure of the lower esophageal sphincter to relax upon swallowing, and the absence of effective peristalsis in the body of the esophagus. 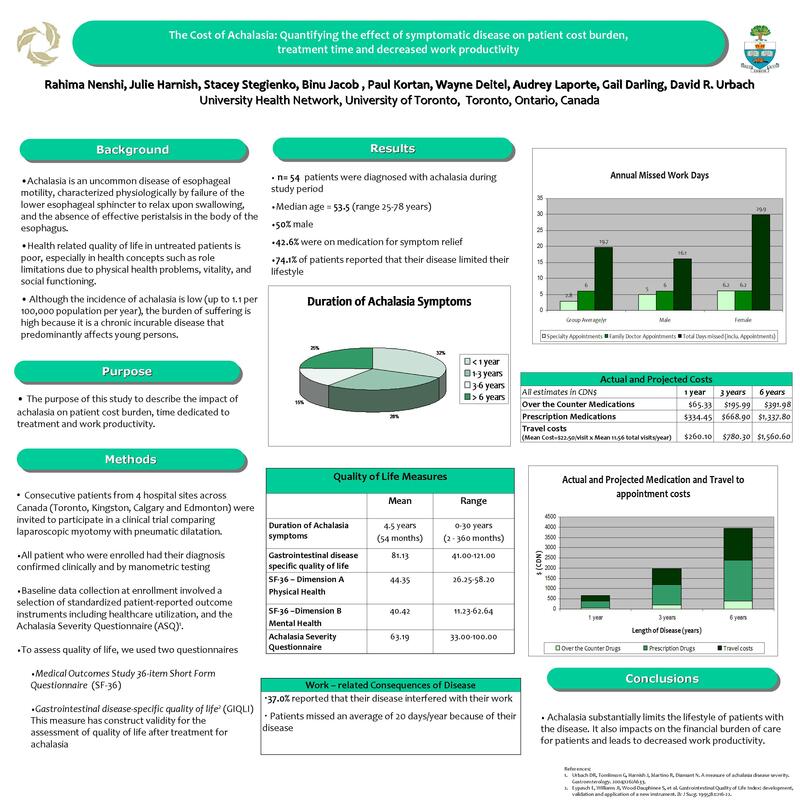 Although the incidence of achalasia is low, the burden of suffering is high because it is a chronic incurable disease that predominantly affects young persons. This paper aims to describe the impact of achalasia on patient cost burden, time dedicated to treatment and work productivity. METHODS AND PROCEDURES – Consecutive patients from 4 general surgery practices across Canada (whose clinical and manometric diagnosis was confirmed) were invited to participate in a clinical trial comparing laparoscopic myotomy with pneumatic dilatation. Baseline data collection at enrollment involved a selection of standardized patient-reported outcomes instruments including the Healthcare Utilization Questionnaire (HUQ) and the Achalasia Severity Questionnaire (ASQ). RESULTS – Questionnaires were completed by 49 patients (mean age = 51.0, 49.0% male). Patients had been experiencing symptoms for a mean of 4.4 years and 44.7% were on medication for symptom relief. 72.9% of patients reported that their disease limited their lifestyle. Patients spent an average of $35.8 (CAD) a month on medication. 37.5% reported that their disease interfered with their work, and patients missed an average of 10.5 days/6months. Patients also spent an average of $23.1 (CAD) on transportation to and from each clinical appointment. CONCLUSION – Achalasia substantially limits the lifestyle of patients with the disease. It also impacts on the financial burden of care for patients and leads to decreased work productivity.